Western Whiskey Gazette (WWG): Henry who? I don't generally stray too far from "The City" (S.F.) when it comes to my collecting focus, but every once in a while a bottle jumps out at you. The embossing is razor sharp, the glass pristine, and the bottle is overall issue free. It is without a doubt one of the best examples of a clear German Connection applied top fifth I've ever seen. I got to wondering about H. (Henry) Weinreich. A quick sudy of his early life (pre-liquor wholesale) was interesting. Henry Weinreich, one of the well known and long time residents of Sacramento, is a native of Bavaria, now in the empire of Germany, born near Kaiserslautern, on the 10th day of December, 1823, his parents being Charles and Henrietta (Silverman) Weinreich, the father a comb manufacturer by occupation. Henry Weinreich spent his boyhood days at the place of his birth, receiving his education in the Government schools, between the ages of six and fourteen years, receiving considerable knowledge of business also, while engaged with an uncle, a wholesale merchant. He was but a boy when he determined to come to America, and in January, 1839, he sailed from Havre in the American sailing vessel Creole, bound for New Orleans, which port he reached on the 14th of April, having worked his passage across the Atlantic. He remained in New Orleans for some time, and there met some people with whom he was acquainted. He went up the rivers to Cincinnati, and thence into the country in Hamilton County, Ohio, where he worked for some time. He next went to Columbus, and there worked for a firm named Comstock & Clark, who were extensively engaged in the patent-medicine business. In May, 1842, he went to Van Buren County, Iowa, where he obtained employment with a man named Phillips, agent for the Sac and Fox Indians, who were then being moved to the Raccoon Forks, and Mr. Weinreich went there on that business, afterward returning to Van Buren County. He made several trips between the two localities, being engaged with his employer in all five or six months. His next employment was cutting walnut logs on Fox Island, and running them down the river to St. Louis, this being the commencement of that enterprise. He next went to the pineries of Wisconsin, and had an extended experience. He was the first man to strike an axe into the timber at the present site of Eau Claire. Chippewa Falls and other localities well known now in the lumber industry were visited by him when in their infancy. In connection with another man he built a sawmill, and did a large business in the manufacture of lumber. That region, however, was not well suited to his health, and in 1850 he went to St. Augustine, Texas, where he kept a restaurant. In the latter part of 1851, in company with thirteen others, he started for California. They went to New Orleans, thence to the city of Mexico (by team and on horseback) and from there to Acapulco. They there took passage on the schooner Guadaloupe No. 1 for San Francisco, paying their fares to the captain before the vessel started, that official saying he would take on provisions at Mazatlan. When they touched there it was found that the captain had got rid of the passage money, and the representatives of the company owning the boat held her, and would furnish no supplies. The American consul was applied to by the passengers, but could not help them out of their dilemma. They then concluded to take the matter in their own hands, and, running the vessel out of the harbor without a clearance, they put into Cape St. Lucas, where they bought and killed cattle and dried the meat in the sun, also taking some live animals on board. They obtained other supplies at San Jose, Mexico, and then proceeded to San Francisco, which port they reached after a voyage of sixty-four days, and there turned the vessel over to the captain. Mr. Weinreich went to Tuolumne County, where he engaged in manufacturing shingles, and also took a contract for making 100,000 shingles. In the fall of 1852 he went out of that business, and putting up a building in Sonora went into the mercantile trade. In the fall of 1854 he came to Sacramento, and engaged in the cigar and patent medicine business, which engaged his attention until the fall of 1856, three wagons being employed by him at that time, as his trade was wide-spread throughout the mining camps. His next occupation was keeping a billiard hall, and in 1858 he embarked in cattle-ranching on a tract of land adjoining the Haggin grant, and shortly afterward drove up here from Los Angeles County 220 head of horses. He traveled nearly eight years for a San Francisco firm and also carried on business at Markleeville for a time. In 1868 he established his present business next door to the number now occupied by him, into which he moved in 1878, though he is the owner also of buildings adjoining. Mr. Weinreich was married in Sonora, in February, 1853, to Miss Anna Weber, a native of Hanover. They have four children, viz: Laura, Addie, wife of H. C. Chipman, member of the Board of Education; Charles and Katie. Mr. Weinreich is one of the old-time members of Tehama Lodge, A. F. & A. M., having joined in 1856. He is also a member of the Red Men, and of the Sacramento Turn-Verein. Must not have been in business long, I thought, since the bottles are scarce. I looked in the Thomas book; no listing. Wilson has one variant as #146-8, ca. 1890 - 1896. He mentioned another variant which was similar and dated it ca.1897 - 1898. Not much in the way of the business history is mentioned; just a partnership with a "Lohse" in 1870 and another with a "Bartels" in 1880. He states that the bottle is rare. The bottle Wilson pictures is a tool top, with no mention of an applied top variant. Bob Barnett lists both a tool and a glop top (#832) and dates it 1890 - 1898; overall same as Wilson. So, just how accurate was the information? Weinreich is now listed first, indicating that he was now the senior partner. In April of 1872, a change occurred when William Bartells was admitted as a partner and the name of the firm was changed to Weinreich, Lohse & Co. They advertised extensively, running the same ad almost daily for the next three years. In July of 1876, the firm's name was changed to Weinreich and Bartels and advertising dropped to zero. A notice of a Dissolution of Copartner ship appeared on Nov. 12, 1880. Oddly, there is no mention of H. Weinreich and or H. Weinreich & Co. until a news article appeared on Sept. 11, 1884 mentioning that "H. Weinreich & Co's. truck (I'm guessing delivery wagon) broke down at 4th & J St. streets yesterday afternoon". A news article dated May 27, 1885 caught me by surprise. It was an announcement of co-partnership between Henry Weinreich and Frederich Raschen; the firm going by the name H. Weinreich & Co. But, still no advertising~. Finally, on the 4th of July 1892 an advertisement appears. But not for whiskey, instead for champagne; and then, once again nothing. At long last, in March of 1893, a Weinreich ad appears for - (huh?) - Canadian Club Whiskey. He either was doing a land office business pushing Canadian Club, or he overstocked and was doing his best to dump it, because he continued to push it hard for the next couple of years. 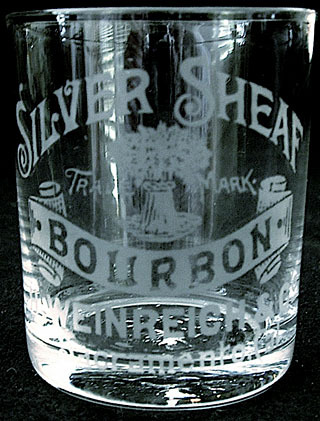 Finally, in September of 1895, an ad appears for what would become a Sacramento mainstay brand; Silver Sheaf Whisky (note KY). This coincides with the appearance of an acid etched pre-pro advertising glass for the same. This same ad ran continuously, every day, for the next couple of months. And then again, no advertising. Finally, in late November of 1897, advertising began anew. Only this time it was for "Wines for the Holidays". This ad ran pretty much continuously through the Christmas / New Years Holiday season of 1897. On March 1, 1899, the final page of the H. Weinreich wholesale liquor saga appears; the dissolution of co-partnership with Raschen, and the announcement that F. Raschen was going to continue on in the wholesale liquor trade at the same address. 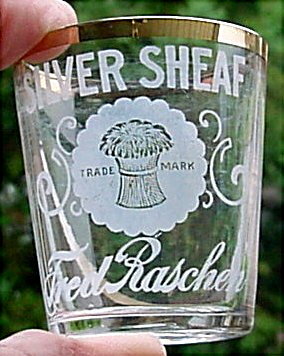 By the first part of May 1899, Raschen was in high gear promoting his business as the successor to H. Weinreich & Co., and continuing to push the Silver Sheaf brand. One can only wonder, what was in the clear glop top German Connection fifth; Canadian Club or Silver Sheaf?